This post originally appeared at Institute for New Economic Thinking. Even today, many academics and pundits still insist that money matters less to political outcomes than ordinary citizens think, even as business executives throw down mind-boggling sums to dine with politicians and Super PACs spring up like mushrooms. The few dissenters from this consensus, like Noam Chomsky, are ignored in the US as “unpersons,” though they are enormously respected abroad. Political scientist Thomas Ferguson, director of research at the Institute for New Economic Thinking (INET), has spent a career setting the record straight with clear empirical evidence in a field where such research has been shockingly rare. Ever since his 1995 book Golden Rule: The Investment Theory of Party Competition blasted through received academic wisdom by showing how wealthy individuals and businesses strategically invest in political parties for the biggest payoff, Ferguson has been the man to seek when you really wanted to know how elections work and who controls them. White-collar criminologist William K. Black and others still recall Ferguson’s famous warning, issued long before the nominating convention in 2008, that the contributions from big finance piling up in Barack Obama’s campaign war chest meant that his promises of sweeping reforms of finance were not to be believed. In 2014, he foresaw the unraveling of America’s two major political parties and predicted that voters feeling betrayed would increasingly abandon both. In recent years, Ferguson has often worked with two other talented researchers, Paul Jorgensen and Jie Chen. The three have tracked the generous funding of Obama by high-tech businesses engaged in spying on the American public and the waves of money from polluters into the Republican Party. [T]here is a strong, direct link between what the major political parties spend and the percentage of votes they win — far stronger than the airy dismissals of the role of money in elections would lead you to think. Their answer is stunning: there is a strong, direct link between what the major political parties spend and the percentage of votes they win — far stronger than all the airy dismissals of the role of money in elections would ever lead you to think, and certainly stronger than anything you read in your poli sci class. Not only in 2012, but in every election for which the data exists (from 1980 to 2012), Ferguson, Jorgensen and Chen found that the graphs came out with neat, straight lines, with minimal scattering of dots. 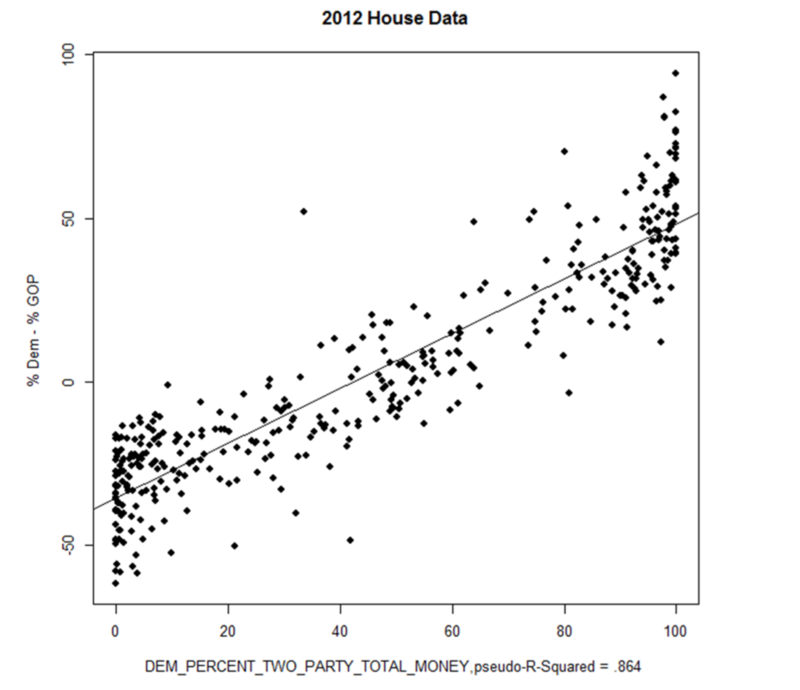 The link is clear: when the Democrats spend more than Republicans, their candidates win. When Republicans spend more than Democrats, they win. There was but one exception, the Senate races of 1982, when Sen. William Proxmire (D-WI), whose disdain for fundraising was legendary but who still won elections, brought down the average. Otherwise, with alarming regularity, Democrats and Republicans candidates’ share of the vote was correlated, to an astonishing degree, with the amount money spent in the campaign. Nothing like this graph has ever made its way into a political science textbook. That it now exists sure should change what Ferguson, Jorgensen and Chen call the “optics” of the campaign finance discussion. But will it? Because of this money-driven system — which has been getting worse since 1970s up to the current dysfunctional mess — when the rich don’t feel like paying taxes, we all suffer. Ferguson, Jorgensen and Chen tackle this issue head-on. They use a cutting-edge method invented by Dutch statistician Peter Ebbes and recently studied by Irene Hueter in another new INET paper. The researchers find that while reciprocal causation happens, its extent is not large: money’s effect is direct and powerful. Their paper closes by examining the notion that right-wing politics in America has been driven by donations piling up from eccentric entrepreneurs like investor and conservative mega-donor Foster Friess — the sort of people who are widely imagined to populate the Forbes 400 list of wealthiest Americans — rather than mainline big business corporations, such as those on the Fortune 500 list. Stories that the steady rightward drift of the American political universe is somehow the work of exceptionally ideological individual entrepreneurs are huge oversimplifications. If the center is not holding in American society — and it rather plainly is not — America’s largest companies are as implicated as anyone else; indeed, perhaps more so. This state of affairs explains why economic inequality has grown into a crisis, with social unrest amplified by economic distress. Because of this money-driven system — which has been getting worse since 1970s up to the current dysfunctional mess — when the rich don’t feel like paying taxes, we all suffer. Infrastructure collapses, schoolchildren and sick people suffer, and hardworking citizens are robbed of their fair share of the country’s prosperity and end their lives struggling keep body and soul together. It goes without saying that this news is not reassuring; particularly in elections below the federal level — in state and local elections, we suspect, money has come to dominate outcomes to a frightening degree, not least because it is unlikely that the Republican advantage is offset there to the degree that it has been in recent federal elections. If it turns out that the US has entered a post-democratic age, the situation will not be improved by social scientists behaving like ostriches. It is time economics, political science and history recognize the reality of industrial and financial blocs within parties and acknowledge money’s powerful effects on elections. Lynn Stuart Paramore is senior research analyst at the Institute for New Economic Thinking and a contributing editor at AlterNet. She is co-founder of Recessionwire, founding editor of Next New Deal and the author of Reading the Sphinx: Ancient Egypt in Nineteenth-Century Literary Culture. Follow her on Twitter: @lynnparramore. Morning Reads: North Carolina GOP Pushes Cuts to Early Voting; Is Trump Aiming to Build a Media Empire?